We're sweetening the world around us. Seek&Bee is the premium bee and natural honey lover’s source of goodness. We’ve combed the world to bring you the best independent bee products and local honey on the market. Brought to you by husband and wife team Holly and Tom, Seek & Bee wants to bring the world the benefits of a backyard hive – without having to own one. Along with our raw, unfiltered honey and other natural products, we’re here to spread awareness and interest in the health and well-being of one of the most precious members in our community: the honeybee. While we’re focused on the well-being of the honey bee, we also love teaching about the impact, flavors, and joy the bees bring to our community. They are an exciting way to reconnect children and adults with the wonders and wellness benefits of the natural world. We want everyone to enjoy the benefits of having a backyard hive without having to own one! Our honey is sourced from responsible beekeepers who share our passion for healthy living and positively impacting the environment. We focus not only on local honey, but also the delicious varietals that can be found around the world. To us, honey is more than just a sweetener – it’s a component of wellness and a connection to our environment. 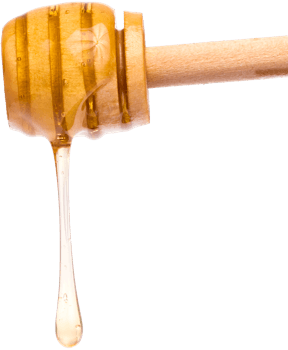 Our honey is raw – never heated – and unfiltered so that our customers get all of its benefits. We inspect each of our suppliers, apiaries, and manufacturing facilities carefully, and only work with those who share our passion for the environment, the bees, and the direct-from-the-hive experience. We minimize our use of plastic that has the potential to leak chemicals or cause harm to our planet, and our honey is only bottled in glass. We want our process to be as close to “hive to bottle” as possible. Why? Because great-tasting, environmentally conscious honey is worth it. Focusing on the well-being of honey bees means educating our community about why they're so important. To learn more about the lives of bees, how they impact us, and how much their honey and hive products matter, explore below. Probiotic Deodorant - That Works! Delicious, unfiltered honey and local hive products are never far away. Visit one of our locations and see what all the buzz is about.